Sometimes the last thing I read before I go to bed are cookbooks. If my dreams aren’t filled with nightmares about work, they are filled with cooking. Usually experimental cooking gone horribly wrong. The past few nights, I’ve been studying Jessica Seinfeld’s cookbook, Deceptively Delicious. I was thinking that I could possibly try something right away and blog about it. I was wrong. I read the book almost cover to cover. It’s not the type of cookbook you can buy and start using that same day. There’s a lot of prep work involved. Among the list of suggested equipment near the front of the book are recommendations on how to prep veggies prior to cooking. By prepping the veggies, it means steaming the veggies and pureeing them. Included in the book is a puree how-to for each veggie. 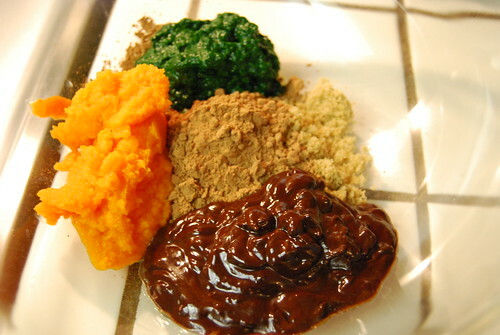 The recipe I chose to try out first were brownies with a cup each of pureed spinach and carrots. Mrs. Seinfeld suggests cooking the spinach for 90 seconds with a teaspoon of water in a skillet until wilted prior to pureeing. The carrots required steaming for 10 to 12 minutes then pureed for 2 minutes with a few teaspoons of water until smooth. Easy enough. A bag of baby carrots equaled three cups of puree while a bag of baby spinach only made a cup. 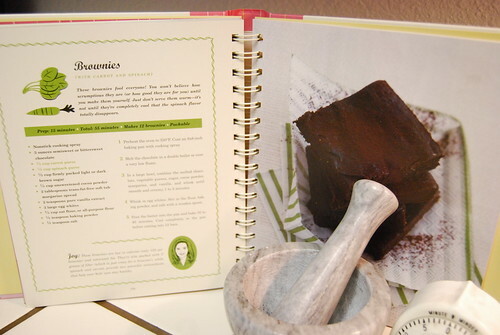 Other ingredients for the brownies included melted bittersweet chocolate, brown sugar, unsweetened cocoa powder, trans-fat-free margarine spread, vanilla extract, egg whites, flour, baking powder and salt. Aside from the purees, I thought that the inclusion of trans-fat free margarine was odd. But I guess she doesn’t want any chubby kids. You know how that childhood obsesity thing has been crammed down our throats lately. After all has been combined, it was the consistency of brownie batter and was well, brown. Not a thick rich brown that I’m accustomed to but brown nonetheless. But even more telling was that no one volunteered to lick to bowl, especially since the smell of cooked spinach still lingered. Suggested serving of the brownies is to let them cool completely. According to the recipe, it’s not until they’re completely cool that the spinach flavor totally disappears. Admittedly, I didn’t test that theory. I threw the entire pan into the refrigerator to completely kill any spinach taste. What’s the jury’s take on this? After all the grueling prep work, I would make this again. Maybe even bring it to work if I was daring. 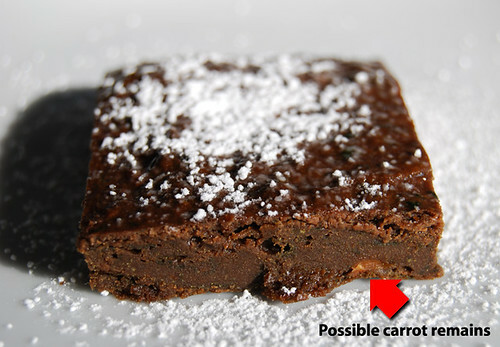 There was a definite brownie taste, although I spied some carrot remnants that even a sprinkling of powdered sugar could not conceal. The texture was dense and flatter than I prefer. That could also be a result of using a baking pan a size too big. As for my unwilling taste-tester, he prefers the real thing sans the nutritious health benefits. Sometimes a brownie just has to be a brownie. NEXT UP: something to do with the two 1-cup bags of pureed carrots in my freezer. This raised more than my eyebrows! Never in a million years would I have thought to combine veges into brownies! Love the Paul quote btw! So funny! This recipe lost me at melted chocolate. I'm lazy. I can't steam/boil, puree, and melt chocolate. Sorry. And moms are supposed to be doing this? And, by the way, you're not supposed to tell the "kid" that there are veggies in them. Not so much Deceptive otherwise. Whoa! I'm too lazy to do that, but I'm impressed by your hard work! And that drawing of Paul is hilarious! Yeah, being in Amsterdam, I thought of something else entirely when I read "green thing" and "brownie." Durn it, where's my taima!?! I'm very disappointed in the lack of mind-altering additives. why not use infant food for the pureed veggies? Trans-fat is not about getting fat, it's about cholesterol and heart disease. 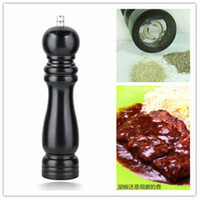 It RAISES your bad cholesterol (LDL) and LOWERS your good cholesterol (HDL). A double whammy. For those of us who struggle to keep the right one up and the right one down, it's a very important ingredient to avoid. Loved your post and your blog – You're in the Google Reader!I've made a bunch of stuff from this cookbook – being pregnant the idea of food that's green is just gross so I've been fooling myself. I've made the oatmeal bars (you can read about that here: http://casscomerford.wordpress.com/2007/11/11/you-can-substitute-raspberry-for-blueberry/)and the chocolate chip cookies multiple times (you can read about the cookies here: http://casscomerford.wordpress.com/2007/10/14/your-bootiful/) I've learned something very important. You must really mash the crap out of your veg for it to be really "hidden". You should look at "The Sneaky Chef" instead of Seinfeld's knock-off book. The sneaky spinach puree also includes blueberries, has a longer cooking time and leaves no smell of taste in your brownines. I've been throwing in my normal reipe instead of oil for weeks now and no one can tell. Oh, and by the way, on the "sometimes a brownie should just be a brownie…"AMEN. What! I have never heard of this but I love that you tried it!